What Is Meant by Data Visual Analysis? Data Visual Analysis is an advanced form of analysis differing from spreadsheets and Business Intelligence (BI) tools. Visual analysis enables the user to interact real time with the data. Instead of reading through mind-numbing rows and columns of data, insights from the visualizations pop to your attention instantly. Visualizations allow for deeper exploration of the numbers than static spreadsheets and BI reports. At Data Visual Analysis Group (DVA), we believe business data is full of insights, better translated in intuitive visualizations. We believe analysis of data should take minutes, not weeks. Above all, we believe understanding your data can lead to greater business success. We assist our clients in overcoming their Analysis Challenges by delivering positive benefits with data visual analysis. What Is Gained from Data Visual Analysis? Unearth revenue opportunities, spot trends, increase operational efficiency, and manage financial risk. Ask questions and get answers quickly in a format meeting your needs – from executive dashboards to workbooks featuring data visualizations. Data visual analysis gives you the opportunity ask “What-ifs” of your data without the need to go ask someone else. What Is Needed to Generate Comprehensive Visualizations? Effective visualizations require connecting to disparate data sources including business applications such as accounting and customer relationship management systems, transactions systems, Google Analytics and even from the Web. The key is sourcing and cleaning the right data from spreadsheets, SQL databases, Hadoop, the Cloud, etc. without writing code. Blending the data and joining tables prepares the data for analysis where you can visually see relationships, apply trend lines, and use correlation algrothrims to answer business questions in minutes. 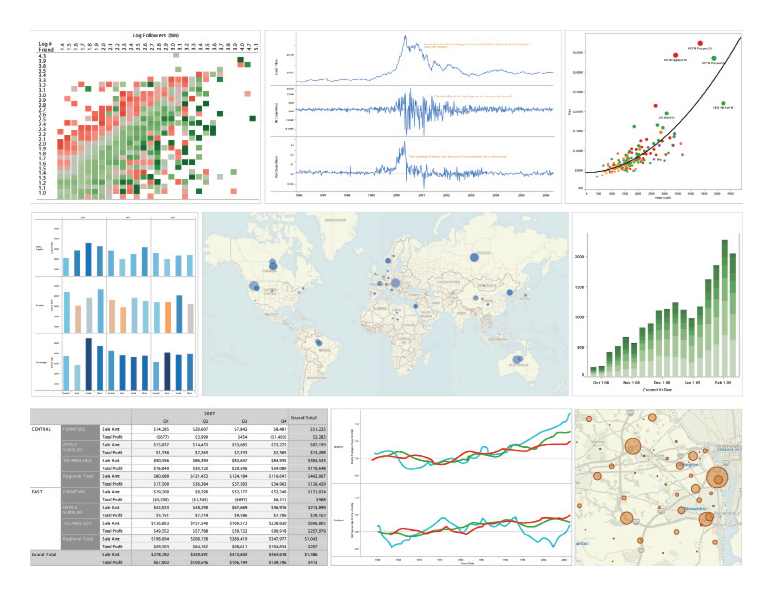 How are data visualizations built and what are they used for? DVA use Tableau Software to construction visualizations which then form the base for Dashboards. Dashboards consist of interactive charts, graphs, and also provide the ability to drill down to analyze the data in more depth. They offer a level of ease of use and high level of interactivity that does not exist in other forms of BI delivery tools. The DVA Dashboards are designed to support decision making by meeting specific business user information needs and requirements. For example, Dashboards are used to display metrics (KPIs) that immediately inform the users how activities are progressing and what actions should be taken to improve performance. 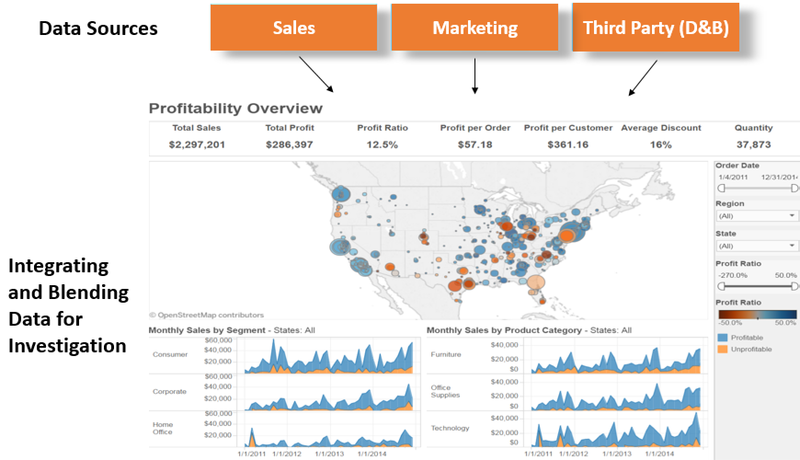 View how DVA created two Dashboards using Tableau Software to address the issues of improving customer profitability and customer retention. These illustrations are just a couple of examples of how data visualizations can be turned into Dashboards aimed at improving business performance by monitoring KPIs. HOW TO IMPROVE WEBSITE PERFORMANCE USING DATA VISUALIZATIONS? DVA delivers a library of reports using visualizations to detail a company’s website traffic volumes with visitor engagement metrics. The report information is captured from the data in the company’s Google Analytics (GA) account. While GA is an enormous storehouse of data, the platform is intimidating, confusing and difficult to navigate for most users. Our reports (currently 31 in total) are concise and easy to read. They are structured around key questions most users of GA would love to ask but can’t without creating a custom GA report or using a 3rd party BI software tool. Ouch!! Within a typical report, we combine traffic and engagement metrics which gives the user a far more useful understanding of their visitors than the volumes alone. Combined with 12 week trending history, current visitor activity is put into its proper perspective. By looking at the total picture including 12 weeks of history, the user can find under-performing traffic channels and then see which areas need optimization. 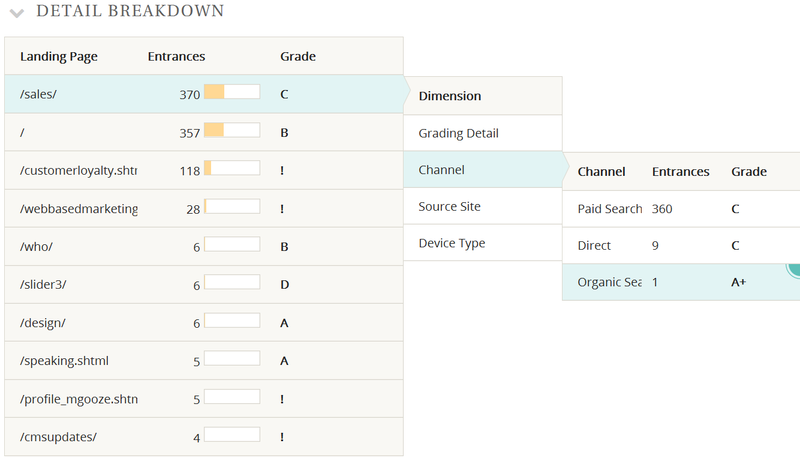 Similarly, the user can find high performing channels with low volume and then take actions to grow that channel. The grading methodology is also customizable. With DVA’s Web Reporting Service, we can automate the website analysis and reduce the reporting workload. We also inspire continual improvement with goal setting KPIs and monitoring, backed up by the data. View examples of some of these reports below and click the link to see a more detailed description of the reporting service.